1 A None No Power Seat 1 A is a standard Business Class seat located at a bulkhead that transforms into a fully flat bed. The light from the galley might be bothersome during sleep. 1 B None No Power Seat 1 B is a standard Business Class seat located at a bulkhead that transforms into a fully flat bed. The light from the galley might be bothersome during sleep. 20 A None No Power Seat 20 A may have restricted legroom due to the bulkhead in front as well as no recline due to the Exit Row behind. 20 B None No Power Seat 20 B may have restricted legroom due to the bulkhead in front as well as no recline due to the Exit Row behind. 20 C None No Power Seat 20 C may have restricted legroom due to the bulkhead in front as well as no recline due to the Exit Row behind. 20 D None No Power Seat 20 D may have restricted legroom due to the bulkhead in front as well as no recline due to the Exit Row behind. 20 E None No Power Seat 20 E may have restricted legroom due to the bulkhead in front as well as no recline due to the Exit Row behind. 20 F None No Power Seat 20 F may have restricted legroom due to the bulkhead in front as well as no recline due to the Exit Row behind. 21 A None No Power Seat 21 A may have extra legroom due to the Exit Row in front. The seat cushion is about half the thickness of others on the plane, which some find uncomfortable. 21 B None No Power Seat 21 B may have extra legroom due to the Exit Row in front. The seat cushion is about half the thickness of others on the plane, which some find uncomfortable. 21 C None No Power Seat 21 C may have extra legroom due to the Exit Row in front. The seat cushion is about half the thickness of others on the plane, which some find uncomfortable. 21 D None No Power Seat 21 D may have extra legroom due to the Exit Row in front. The seat cushion is about half the thickness of others on the plane, which some find uncomfortable. 21 E None No Power Seat 21 E may have extra legroom due to the Exit Row in front. The seat cushion is about half the thickness of others on the plane, which some find uncomfortable. 21 F None No Power Seat 21 F may have extra legroom due to the Exit Row in front. The seat cushion is about half the thickness of others on the plane, which some find uncomfortable. 24 F None No Power Seat 24 F is a standard Economy Plus seat. 25 F None No Power Seat 25 F is a standard Economy Plus seat. 26 F None No Power Seat 26 F is a standard Economy Plus seat. 27 F None No Power Seat 27 F is a standard Economy Plus seat. 36 D None No Power Seat 36 D is a standard Economy Class seat. There is no overhead bin storage for this row. 36 E None No Power Seat 36 E is a standard Economy Class seat. There is no overhead bin storage for this row. 36 F None No Power Seat 36 F is a standard Economy Class seat. There is no overhead bin storage for this row. 37 A None No Power Seat 37 A is a standard Economy Class seat. There is no overhead bin storage for this row. 37 B None No Power Seat 37 B is a standard Economy Class seat. There is no overhead bin storage for this row. 37 C None No Power Seat 37 C is an Economy Class seat where the close proximity to the lavatories may be bothersome. There is no overhead bin storage for this row. 37 D None No Power Seat 37 D is an Economy Class seat where the close proximity to the lavatories may be bothersome. There is no overhead bin storage for this row. 37 E None No Power Seat 37 E is a standard Economy Class seat. There is no overhead bin storage for this row. 37 F None No Power Seat 37 F is a standard Economy Class seat. There is no overhead bin storage for this row. 38 A None No Power Seat 38 A is an Economy Class seat in the last row of the plane. The close proximity to the lavatories may be bothersome. There is no overhead bin storage for this row. 38 B None No Power Seat 38 B is an Economy Class seat in the last row of the plane. The close proximity to the lavatories may be bothersome. There is no overhead bin storage for this row. 38 C None No Power Seat 38 C is an Economy Class seat in the last row of the plane. The close proximity to the lavatories may be bothersome. There is no overhead bin storage for this row. 38 D None No Power Seat 38 D is an Economy Class seat in the last row of the plane. The close proximity to the lavatories may be bothersome. There is no overhead bin storage for this row. 38 E None No Power Seat 38 E is an Economy Class seat in the last row of the plane. The close proximity to the lavatories may be bothersome. There is no overhead bin storage for this row. 38 F None No Power Seat 38 F is an Economy Class seat in the last row of the plane. The close proximity to the lavatories may be bothersome. There is no overhead bin storage for this row. 4 E None No Power Seat 4 E is a standard Business Class seat that transforms into a fully flat bed. The proximity to the lavatory area might be bothersome. 5 A None No Power Seat 5 A is a standard Business Class seat located at a bulkhead that transforms into a fully flat bed. The proximity to the galley and lavatory area might be bothersome. 5 B None No Power Seat 5 B is a standard Business Class seat located at a bulkhead that transforms into a fully flat bed. The proximity to the galley and lavatory area might be bothersome. 5 E None No Power Seat 5 E is a standard Business Class seat located at a bulkhead that transforms into a fully flat bed. 5 F None No Power Seat 5 F is a standard Business Class seat located at a bulkhead that transforms into a fully flat bed. 6 A None No Power Seat 6 A is a standard Business Class seat that transforms into a fully flat bed, however, this seat has a misaligned window. 6 E None No Power Seat 6 E is a standard Business Class seat that transforms into a fully flat bed. 6 F None No Power Seat 6 F is a standard Business Class seat that transforms into a fully flat bed, however, this seat has a misaligned window. 7 A None No Power Seat 7 A is a standard Business Class seat that transforms into a fully flat bed, however, this seat has a misaligned window. 7 F None No Power Seat 7 F is a standard Business Class seat that transforms into a fully flat bed. AC power ports are located at each seat in BusinessFirst and there are two outlets for each set of triple seats in Economy. Full service meals, snacks, and beverages are available on all United Airlines flights. Type of service depends on class and length of flight. p.s. 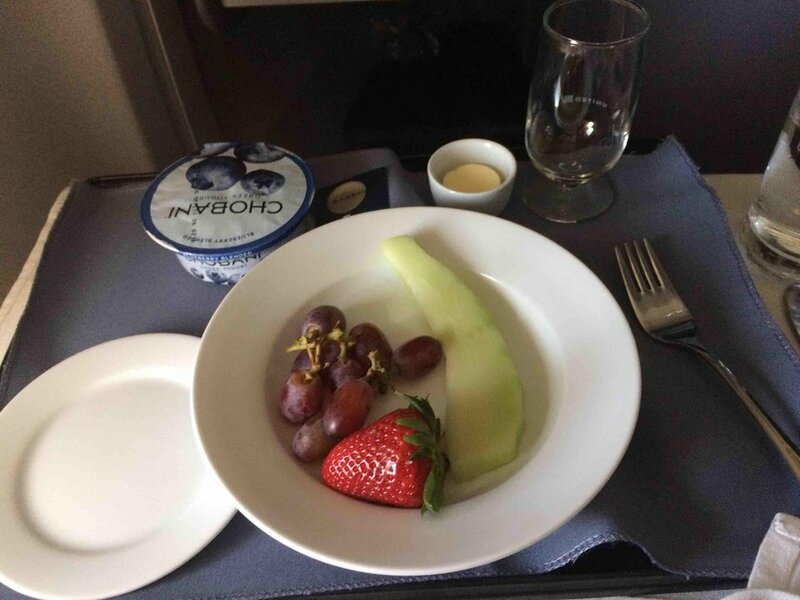 Premium Service includes a level of meal service normally found on international routes. Additional information may be accessed by clicking here. The seat map for this United Airlines 757-200 features United's p.s. Premium Service. The aircraft has p.s. Premium flat bed seats, Economy Plus seats featuring extra legroom, and Economy seats. The aircraft is used primarily on transcontinental routes from Newark (EWR) to Los Angeles (LAX) and San Francisco (SFO). Other than the fact that this old bird seemed to be 20-plus years old, it wasn't a bad configuration in basic economy. I am 6' 3" and 270 lbs. and I fit in the seat without issue (and without spilling over into the center seat). Enough legroom to the point where I didn't feel uncomfortable... in fact, I would not pay the extra money for the extra couple of inches for Premium Economy. Save your money on that. This needs to be RED. 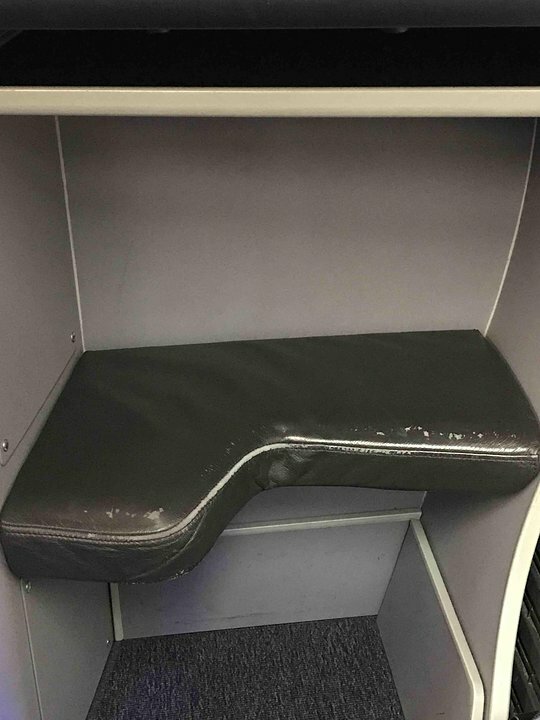 The seat is BELOW the level of the other economy seats. I had a bare metal seat back pocket frame (with no seat back pocket) sticking into my legs. UA Premier customers usually book exit rows on line as a premium service, this row is marked as an exit row and the customer is "tricked" into sitting there. Rows 1 + 5 have significantly more room in the foot space in First due to the bulkhead configurations. The cushion on the seat was as soft as the others in this row and in this class of service. The arm rest on the seat next to the window (21F) is ½ the length of the other arm rests. If is not as long as the others. So be prepared especially if you are not a tall person or like to rest your full arm. Also this seat is extremely cold. There is plenty of leg room. We flew from SFO to EWR on a 757-200 in the exit row. Worst seats on the entire plane. Seats did not recline and significantly less legroom due to bulkhead. 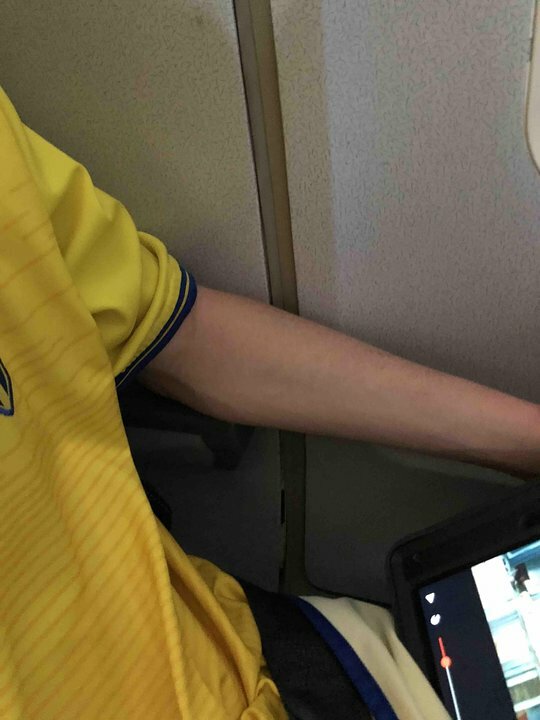 The armrest on seat 20A was 1/4 of the size. See pictures. Longest 5+ hour flight Ive ever taken. first row business class seats have wider footrest than other seats in other rows. Best in the class. Best type of seat in the United fleet hands down. Because this was an economy plus seat, as a person who was 5 5' at the time, I could sit on the ground with enough space. Tv's are loaded with many shows and movies. Beware of seats 2A and 2F. Because the seats are angled towards the window, the shelf to place your feet when the seat if fully extended, is significantly reduced compared to to foot space in the adjoining aisle seats 2B and 2E. When I slept there was barely enough space for both feet in that seat; it was very uncomfortable. On the united ps 757 with 7 rows of lie flat seats, row 5 is by the second door to the plane and has extra wide legroom compared to rows 2-4 and 6-7. Row 1 has the wide legroom as well. Decent seat. Seat cushion is on the thin side, compared to the international configuration and its older seats. OTOH the AVOD system is much more modern and works a lot better; no need to press the screen hard and bother the passenger in front. Regulating the temperature with the overhead vents can be a bit tricky. When flying the United Premium Service between EWR and LAX/SFO, I prefer these dedicated ex-UA aircraft to the older ex-CO international aircraft. The entertainment box under each seat further restricts leg room. I was moved to seat 20A bc United booked a group of children to sit in this row (exit row). Flying from EWR to LAX was long. The not working new tv sets made the long flight even longer. No legroom, no recline, no under-seat storage...United needs to remove row 20 altogether. These seats are blocked for those who might need a wheelchair. Legroom in the aisle seats in economy on this PS plane is severely compromised. There is a box for the entertainment system that takes up about 1/3 of the space under the seat in front of you. This means that (1) you have to bend one leg to the side which gets uncomfortable on transcontinental flights and (2) the space is too narrow to fit a standard laptop bag under the seat. The middle seat looked like it had tons of legroom, the window seat looked compromised by another box. DEN to IAD in seat 1A. I was completely surprised. Best seat we've had on any domestic flight for many years. The seat cushion is thick and supportive, covering much better than the usual slick plastic. So comfortable I never played with the lie-flat position. Seats are angled away from the aisle just a bit, really adds to privacy. Plenty of storage. IFE was great, although the connection points are unreachable while seated. FAs were very good. Food unremarkable but ok. I even plan to schedule to use this plane where it fits in; I gave up on that years ago on domestic flights. Label this seat RED already as many have commented. You have more legroom in the standard economy seats than this row. Poor design of bulkhead leaves no place to put your feet - pure torture on coast to coast flight. My LAX-JFK flight was an extremely pleasant experience. The flight attendants were courteous and attentive and the entertainment options were more than ample. I am from Australia and was pleasantly surprised by the service I received after hearing horror stories about friends that have travelled to the US and were treated appallingly by rude cabin crew. The plane was calmingly clean and well refurbished. Well done United. The seat is directly illuminated by the lavatory light, it is therefore impossiboe to get darkness to sleep. Flown United PS Service JFK-SFO and back 2-3x per year over last several years. 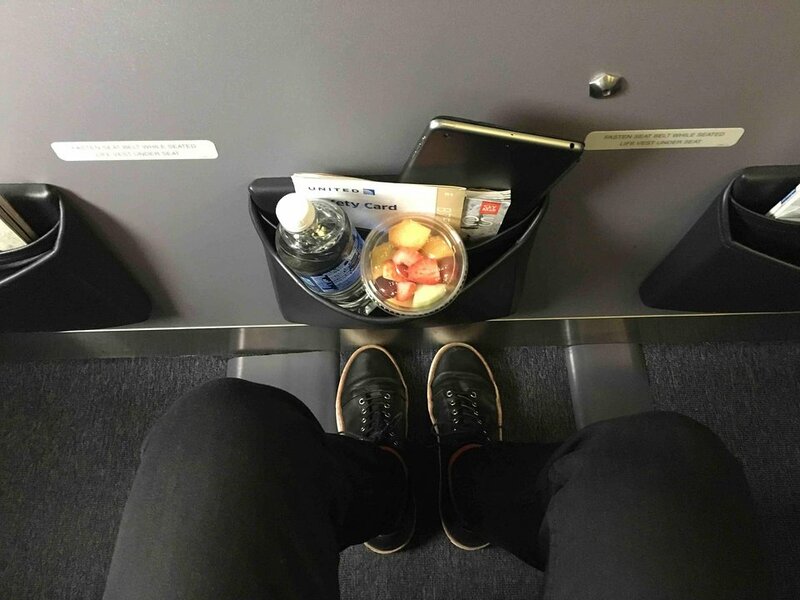 I'm 6'4" and usually find my knees in the seat back in front of me on most coach flights. First time in current configuration. Row 21 gave me 4 to 6 inches of space between my knees and the seatback and I could recline. Video selections in coach were excellent. On return flight, video unit froze - would not take touch input on screen - asked the FA to reset which they did. A good experience overall. Also liked the hot egg breakfast choice on the for purchase menu - at least it's a warm meal. As another user noted, Row 20 should be listed as red. It has notably limited legroom, especially since you cannot put your feet underneath the bulkhead. As a tall individual, my legs kept falling asleep. I generally go for bulkheads, but this was too uncomfortable. I don't want to tell you how nice row 21 is in case you are my competition! So I will just tell you that this is premium plane and it DOES make a difference! Ok, so the plastic rim on my window was falling off, but in general everything seemed better cared for that other planes. the seat was comfortable, lots of leg room, and the on demand video selection was AWESOME. The monitor in the seat back worked very well. Oner person said the service was supposedly better on the PS planes - I wouldn't go that far - it was average for United - but free movies for everyone is a rocking' good idea for keeping people happy. You want to avoid this seat. There is no leg room as it's a bulkhead and it's an exit row. So the seat doesn't recline. It should really be a red seat. I was stuck here for 6 hours on a NY-SF flight the other day. Bad choice by me, as I wasn't aware it was a typical exit row. No other exit rows I am aware of are at bulk heads. Row 21 is ok, but 20 is bad. I have always found that UA's P.S. was the best transcon service in the U.S. The new BusinessFirst seat is the same business seat that was on the pre-merger Continental 757, 767, and 777 fleet. The seat makes a nice and comfy fully lie-flat bed (although I'm only 5'8" so I'm not sure about the length). The IFE is pretty up to date, and the screen is larger than screens I've seen on international flights. The food was fine, standard business class breakfast omelet. The service was great. I think United only puts the most experienced FA's on the transcon p.s. flights. Overall it was a great experience and even though I have yet to fly AA's new transcon, I think UA has set the bar pretty high. 20A and 20F are super tight seats as in you can't extend your leg because of the bulkhead coming down (you better be 5'0" or shorter to enjoy this seat) and the curverature of the plane's hull makes your outer leg push inward towards the center aisle, meaning that your legs might slightly touch the center passenger. These are not good seats....the bulkhead really restricts legroom in the entire row 20. Should be labeled red. 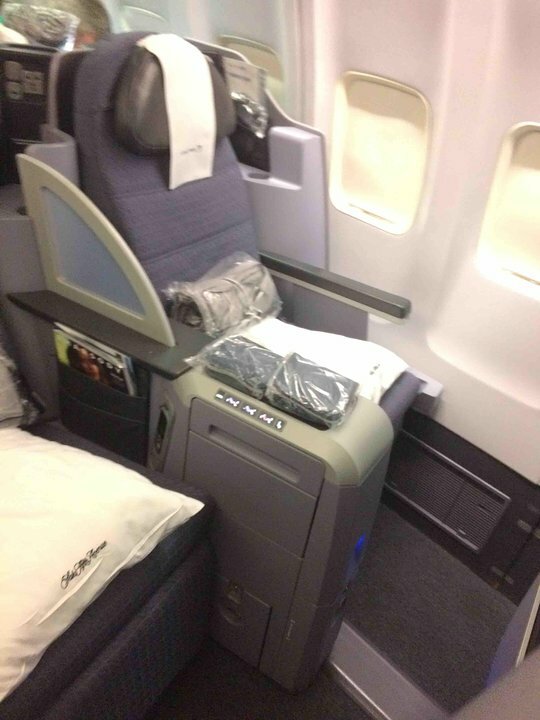 This is a United PS (Premium Service) meaning that 1) the aircraft is overall kept in better shape 2) there are tons of first and business class seats and 3) service is supposed to be better. I sat in economy 28C and the leg room was fine for someone 6'0". This plane had the best inflight entertainment system that i have ever seen in a domestic flight (yes, better than Jetblue!). The LED screen is sharp, doesn't lag, has tons of decent free movies/music and you can even listen to live ATC on music channel 9. The meals were ok, snack boxes were also available for purchase. Great 757-200, you can tell it was revamped with newer seats (there are also standard power outlets between seats, so 2 outlets for every 3 seats). The screen has a standard audio jack and also a USB port to charge whatever you want. All in all, probably the best 757 configuration that i've seen so far. I scored a surprise upgrade with miles (often impossible) on this flight from SFO to JFK. United's policy on boarding is absurd: at least half the passengers are "Group One," because of Mileage Plus status, "needing extra time to board," etc.. When they called for people with children, this couple with two teenagers had the gall to rush to the front. They let them board. The rush is, of course, for overhead space, which is ample. The new business class seats are nice: comfortable in sitting and reclined position. The entertainment system works well. Food = awful. Service was good, but inconsistent. Overall, a very comfortable way to get across the country. I'd be less happy if I'd paid $$ for full fare. All the exist rows on 757s are extremely cold during flight. The blanket is not nearly enough. It seems that the insulation near the exit doors are not as good as the rest of the plane. I take these flights almost weekly, UA824 to JFK, and in the worst case there was frost on the exit door's wall. I have flown this new configuration quite a few times now, though i like the new seats and overall they are excellent, particular the fact that they are slightly trend toward the window is particular nice, However the window seats (A & F) have less storage/Foot space then the Aisle seats. For a tall person/someone with larger feet it gets a bit challenging as the footwell is very narrow and tight. Aisle seat offers a bit more space in that aspect. 5F has a very handy shelf in front, since it's a bulkhead, and it's also private (because of the bulkhead) has no restricted legroom and perfectly fine storage (because of the design of the seat), and is well positions for FA service (they sit near the galley on the jumpseats, in clear view of the seat). Very pleasant seat and more preferable than any other seat in the cabin, in my opinion. The entertainment on this flight was excellent. There were at least 5-6 movies I would have actually wanted to see in addition to many popular TV programs, including those from Showtime, HBO, etc. It made the flight go very quickly and made me forget I was in coach. Worst flight of my life. As the previous user commented, there is NO recline and severely restricted legroom because the bulkhead goes all the way to the floor. United should be ashamed of itself. AVOID AVOID AVOID this row.